We utilize the same DC Gearmotor on both Power Bases (for ball winders) as well as on motorized Skein-winders. It has the designation of x019. It runs at approx. 133 RPM with a torque factor of 100 inch/ounces. This is the standard motor used on all of our equipment. The motor will last upwards of 2,000 operating hours and then needs to be replaced. The brushes inside the motor wear out over time and the gears inside the motor's transmission tend to wear as well. The motor then loses torque as a result. The unit will seem to slip when the brushes wear out. This can also happen if the drive belt (clear 1/4" diameter) has been stretched. Belts stretch in direct response to the load you place on the motor. The gear system which is a combination of metal and plastic gears will also begin to wear out near the 2,000 hour level. Ball winder - black flange o-ring is pressing too tightly against the "pointy shaft" (torque tube shaft). This can act like a brake on your car and makes the motor and the belt work harder than necessary. A dirty ball winder (gears inside the ball winder) can become packed with fiber debris from the yarn. This happens over time. The user must clean the ball winder out periodically. See our youtube video. 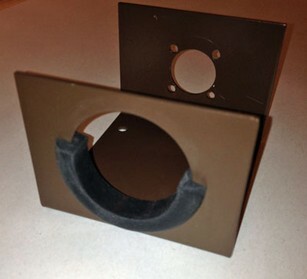 Note: in August 2015 we will make available a new Gasket that will be used to cover the hole in the ball winder which will prevent debris from entering the unit. Stretched drive belt (clear belt that runs between the motor and the pulley on the ball winder or skein-winder). Pulling a heavy amount of yarn from swift or cone. A yarn Jam on swift or cone OR a really heavy and/or inefficient swift. Try to calculate what your usage is on the unit so you can predict when you are approaching the 2,000 hour point. For example, if you use the unit a average of 2 hours per day 6 days per week, you will need a new motor at about 3 to 3 years 3 months. Remember, this is not guaranteed or extremely scientific. It is an approximate estimate. If your business depends on this unit running every day, then get a spare motor at around the 1,500 hour point (at 2 to 2.5 years). This motor has a metal sleeve that fits snugly around it. This additional steel sleeve adds more mass to the magnetic effect that the motor generates and this increases the torque to the 100 inch/ounce level. Do not remove the sleeve on your motor. Removing it may increase RPMs but it will decrease torque which is power. Power is more valuable than speed in most cases. 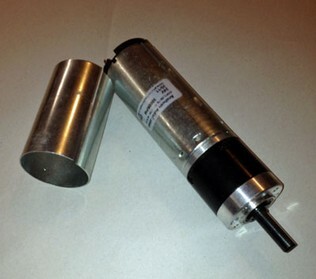 The motors we use are DC Gearmotors. 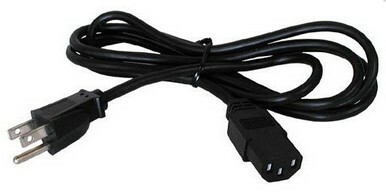 They are powered by 24 volts DC (the Power Supply we use is a 100-240 Volt AC 50/60 Hertz power adapter similar to one you would use on a laptop computer). Our systems can be used anywhere on the planet. Our power supply meets all of the regulatory requirements for most countries. The only thing a user from another country will need to do is add an adapter for converting the plug on the cable below to meet their wall outlet requirements. These motors gear down the max RPM of 3600 by means of a gear system. This then provides power (torque) and turns the unit at a max. of 155 RPM. The motor's output is then multiplied back up by means of our 5X gear system inside the ball winder. So the effective RPM at the spindle head is 155 x 5 = 775 RPM. However, there is a loss of power as a result of the gear system inefficiency and from turning the mass of the ball winder's components and the net RPM is approx 620-640. However, these 620-640 RPM have plenty of power (torque) now due to the gear reduction. We tame some of that power so your yarn does not get torn when a jam occurs by means of our innovative belt and pulley system. So our design provides the power that you need combined with an automatic slippage system when you don't. It is like an automatic clutch system all done in the background for the user. The motor itself with no new pulleys or belts. If you already have a system which uses the clear belts on the Power Base, then all that you need is the motor, you do not need new pulleys. (you should order extra belts, though, unless you already have a stash of CLEAR belts). The older black and orange belts will not work on systems which use the clear belts.